The attack on our mining location has shown that remote bases will be difficult to defend. Our resources are better used defending only a centralized colony. Further analysis of the Blight has confirmed our deepest fears. It cannot be stopped. New Terra is doomed. To survive we must once again take to the stars. The construction of our starship has become our highest priority and will require massive amounts of Rare Ore. Computer projections show that known Rare Ore sites on New Terra will barely have sufficient yield to complete our starship and defend ourselves. Early estimates show our new starship will hold about 200 colonists. Between this and our limited resources, we must be careful about our population growth. Idle the Nursery and University as needed to limit the amount of new children and workers. 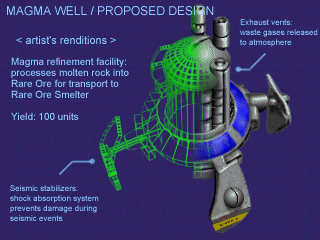 We may wish to explore an idea proposed by one of our scientists for harnessing the magma of New Terra. Although the process is theoretical and potentially dangerous we may have no alternative. We must also continue to grow and protect our colony. Plymouth has become desperate and unpredictable. Some of our vehicle engineers have proposed a new combat chassis that will counter the Plymouth threat. Our astronomers report that New Terra has passed through a large comet's tail and the debris may cause a meteor shower. Be alert to any potential danger from meteor impacts. Recently our Gene Bank was destroyed by subversive elements. We do not know if Plymouth was behind this action or not. The investigation is continuing but without a viable Gene Bank it will be impossible to establish a new colony on another world. The only known surviving Gene Bank is located in Plymouth. Check the Specific Objectives list to see the things we need to be prepared. Keep at least 54 children alive. Keep at least 36 workers alive. Keep at least 27 scientists alive. Completely research Dual-Turret Weapons Systems. Have 2 or more Scouts. Have 4 or more Lynx. Have 4 or more Panthers. Place the Skydock in orbit. Have 8000 units of Common Metals in storage. Have 4000 units of Rare Metals in storage. Have 3000 units of food in storage.